In addition to studies of fire ant biology and response to acoustic stimulation on the university’s Oxford campus, several fire ant studies are under way at the UM Medical Center. Dr. R. deShazo, professor and chair of the Department of Medicine, heads a multidisciplinary research team investigating clinical aspects of red imported fire ant (RIFA; Solenopsis invicta Buren) envenomation and the underlying toxicological basis for the adverse responses to fire ant stings. Much of this effort has focused on the unusual nature of the RIFA venom, which contains a high concentration of nonprotein di-substituted piperidine alkaloids called solenopsins. Synthetic solenopsin alkaloids are provided through collaborative efforts with the National Center for Natural Products Research. DeShazo and Ann Yates, Department of Pediatrics, are focusing on evaluation and treatment of human RIFA stings. Ian Paul, Department of Psychiatry and Human Behavior, is studying the neurological and behavioral effects produced by RIFA solenopsins in rodents. Donna Sullivan, Department of Medicine, and Heather White, School of Health Related Professions, are examining the basis for and selectivity of anti-microbial activity shown by solenopsins. Rob Rockhold, Jerry Farley and George Howell, Department of Pharmacology and Toxicology, and Stephen Commiskey, all Department of Anesthesiology, have demonstrated acute neurological and cardiovascular toxicities associated with administration of solenopsins to rodents. Jerome Goddard, state entomologist for the Mississippi Department of Health, is involved in a study of protective measures, including clothing, against RIFA stings in children and adults. hose who live in the Southeast need only look around to see that a decades-long campaign to eradicate fire ants has been a daunting challenge. Fire ant mounds dot the landscape throughout much of the region, popping up in the green spaces of urban areas just about as frequently as they appear in pastures, gardens and other rural settings. Scientists estimate that red imported fire ants (Solenopsis invicta), which first entered this country from South America in 1929 through the port of Mobile, Ala., inhabit more than 320 million acres, primarily in 12 Southeastern states and Puerto Rico, according to a 2003 USDA report. The insects also have spread to California and New Mexico by riding along with shipments of sod, potting soil and other materials. “Costly” is a key word here. 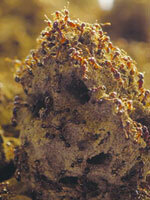 The USDA estimates that fire ants cost the United States more than $6.5 billion a year. Besides stinging, which can occasionally be deadly for those who are allergic or immobilized, the sisters (all the workers of a nest are female siblings) destroy native insects and ground-nesting wildlife, and can damage crops and electrical equipment. After almost a century of combating fire ants, a few things are clear: First, ants are complex social creatures at the top of their food chain, much like humans. Second, a $200 million effort involving widespread broadcast of insecticides proved unsuccessful at eradicating fire ants. Third, any effective solution must, above all, be environmentally safe. The third point is where Anderson comes in. Since his arrival in 2002 at the UM Field Station, where he is a research scientist at the Center for Water and Wetlands Resources, Anderson has been fighting fire ants on multiple fronts. Besides working with researchers from the university’s National Center for Physical Acoustics, or NCPA, to figure out ant-squeak (ants communicate mainly with chemicals, but they also stridulate, or squeak, to one another), Anderson is also testing the cold-hardiness of fire ants, with the objective of making them more susceptible to freezing temperatures. And he is intrigued by the fact that nest mates in a particular colony recognize one another with a touch of the antennae but just as quickly sting to death fire ants from outside colonies. hile he was with the USDA’s Center for Medical, Agricultural and Veterinary Entomology, or CMAVE, at the University of Florida, Anderson studied both fire ants and Mediterranean fruit flies as a postdoctoral researcher. “[Richard Mankin, a well-known acoustic biologist] and I developed an acoustic trap for female Medflies based on the male calling song,” says Anderson, who received his doctorate in zoology and chemical ecology from Florida in 1990. Anderson used an anechoic chamber at CMAVE to record the “sound” of fire ants responding to attack by a phorid fly, a parasitic species being imported into the United States as a biocontrol for fire ants. 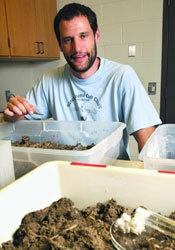 He hopes to further that research here at UM with assistance from both the USDA and NCPA. “It may be possible to mimic the sounds the ants make to disrupt essential activities such as mating,” Highsmith adds. Research assistant Jake Marquess is working to record sounds made by fire ants in response to different situations. The goal is to find a way to disrupt communications within the ant colony. gain drawing on research conducted before he arrived at UM, Anderson is looking at the ability of imported fire ants to withstand cold. For his dissertation, Anderson spent several months camping in the mountains of central Mexico, studying the cold-hardiness of “over-wintering” monarch butterflies. After migrating from as far away as Ontario, Canada, millions of the orange-and-black butterflies hang dormant through the winter on Mexico’s fir trees at 11,000 feet, while temperatures hover around zero Celsius. In short, Anderson found that the monarchs produce a natural antifreeze (increased hemolymph concentrations of glycerol and some small sugars in the butterflies that allow them to survive temperatures as low as minus 14 degrees Celsius). He also discovered that this moderate cold-hardiness absolutely depends on an intact forest canopy. When the butterflies are exposed to water (in the form of dew or rain) or the cold night sky, their freeze-resistance ability is severely compromised. Anderson says that “observations of fire ant nests in winter in the northern Mississippi area suggest a similarity to the monarchs.” Colonies dug up after cold nights have demonstrated that ants with ice crystals attached to them haven’t survived, while those ants that went unexposed to water survived. lthough Anderson is drawing on some of his past research experiences to combat fire ants, he and Marquess are also breaking new ground. He’s coined the term “infolaxis” to describe the method through which he believes fire ants in a particular colony exchange chemical information with one another, research so exciting that talking about it might involve “arm waving,” he says with a laugh. The coinage comes from “trophallaxis,” defined as the exchange of food within a colony in such social insects as ants or termites. Recently, fire ants in a particular colony have been found not only to exchange food but also to swap long-chain hydrocarbons that they blend and store in the postpharyngeal gland, located in their heads, and then smear over the surface of their bodies. This blending and spreading of the hydrocarbon mixture is for nest mates only and is thought to ensure recognition by the other ants, but it also transfers oil-soluble chemicals around the colony from queen to workers and vice versa. Anderson hopes to determine the purpose of the exchange. “We want to find out why they do this and use it against them,” he says. “Basically, if we’re able to understand the chemical signature of fire ants, we may be able to disrupt their nest mate-recognition ability and turn the ants in a colony against each other,” Marquess says. Copyright ©2006 The University of Mississippi. All Rights Reserved. Please send comments and suggestions to ORSP webmaster.